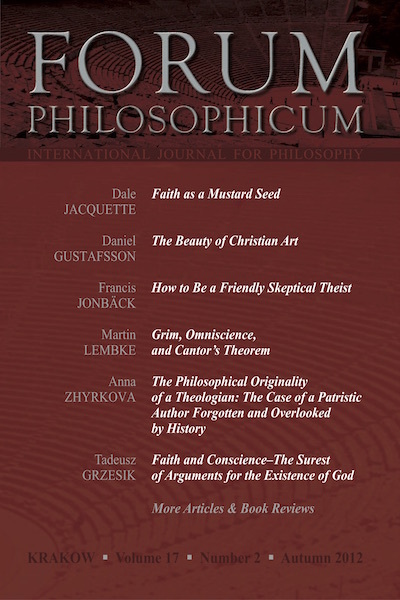 In this issue of the journal, we present our readers with six studies of philosophical problems pertaining to philosophy’s encounter with faith. Dale Jacquette puts forward a close examination of the concept of faith in the manner of Wittgenstein’s essential analysis. Daniel Gustafsson shows how the question of beauty, asked from the point of view of aesthetics, can be given a theological answer in the context of Christian art. Francis Jonbäck defines Frendly Sceptical Theism, by modifying some implicit premises of Williams Rowe’s Friendly Atheism. Martin Lembke proposes some refinements to Alvin Plantinga’s criticism of Patrick Grim’s rejection of the concept of an omniscient God. Anna Zhyrkova explains how deeply the appraisal and meaning of originality differ, in philosophical and theological contexts. Tadeusz Grzesik contends that someone who demands rational proofs of God’s existence is, in point of fact, irrational.